Explain to your counselor the most likely hazards associated with skating and what you should do to anticipate, help prevent, mitigate, and respond to these hazards. Show that you know first aid for injuries or illnesses that could occur while skating, including hypothermia, frostbite, lacerations, abrasions, fractures, sprains and strains, blisters, heat-related reactions, and shock. Give general safety and courtesy rules for ice skating. Discuss preparations that must be taken when skating outdoors on natural ice. Explain how to make an ice rescue. 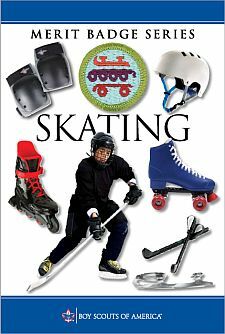 Discuss the parts and functions of the different types of ice skates. Describe the proper way to carry ice skates. Describe how to store skates for long periods of time, such as seasonal storage. Skate forward at least 40 feet and come to a complete stop. Use either a two-footed snowplow stop or a one-footed snowplow stop. After skating forward, glide forward on two feet, then on one foot, first right and then left. Glide backward on two feet for at least two times the skater's height. Skate backward for at least 20 feet on two skates. After gaining forward speed, glide forward on two feet, making a turn of 180 degrees around a cone, first to the right and then to the left. Perform forward crossovers in a figure eight pattern. Explain to your counselor the safety considerations for running or participating in an ice skating race. Give general safety and etiquette rules for roller skating. Discuss the parts and functions of the roller skate. Describe five essential steps to good skate care. Skate forward with smooth, linked strokes on two feet for at least 100 feet in both directions around the rink and demonstrate proper techniques for stopping. Skate forward and glide at least 15 feet on one skate, then on the other skate. Skate backward for at least 40 feet on two skates, then for at least 15 feet on one skate. Skate forward in a slalom pattern for at least 40 feet on two skates, then for at least 20 feet on one skate. Skate backward in a slalom pattern for at least 15 feet on two skates. Shuttle skate once around the rink, bending twice along the way without stopping. Perform a series of two consecutive spins on skates, OR hop, skip, and jump on skates for at least 10 feet. Race on a speed track, demonstrating proper technique in starting, cornering, passing, and pacing. Perform the limbo under a pole placed at least chest-high OR shoot-the-duck under a waist-high pole and rise while still on one foot. While skating, dribble a basketball the length of the floor, then return to your starting position, OR push a hockey ball with a stick around the entire rink in both directions. Give general and in-line skating safety rules and etiquette. Describe the parts and functions of the in-line skate. Describe the required and recommended safety equipment. Describe four essential steps to good skate care. Skate forward with smooth, linked strokes on two feet for at least 100 feet. Stop on command on flat pavement using the heel brake. Perform a series of forward, linked swizzles for at least 40 feet. Skate backward for at least 40 feet in a series of linked, backward swizzles. From a strong pace, perform a lunge turn around an object predetermined by your counselor. Perform a series of at least four one-footed downhill slaloms on pavement with a gentle slope. Describe how to pass a pedestrian or another skater from behind. Describe at least three ways to avoid an unforeseen obstacle while skating. Describe two ways to get on. and off a curb, and demonstrate at least one of these methods.